There is a story behind every meal. Every cocktail. Every quest to make diners in Phoenix sit up and take notice. Phoenix filmmaker Andrew Gooi tells these stories. His videos take you into the sacred spaces of Arizona’s most innovative chefs and tastemaker. Visit Phoenix launches a new video series, Food Talkies. Visit Phoenix video series also highlights unique places to go and things to see, along with Downtown’s nightlife. ASU’s Center for Law and Society unveils its “state-of-the-art” campus in Downtown Phoenix. The new building will have 18 rooms where classes will regularly be scheduled including one large lecture hall dedicated to university undergraduate education. Of the law school rooms, six will be seminar rooms and the remaining 11 classrooms will be of various sizes accommodating from 40 to 120 people, and will include a hi-tech courtroom and an active learning classroom. It encompasses approximately 280,000 gross square feet with two levels of underground parking. In addition to the law school and the retail space on the 1st floor consisting of the bookstore and a café, the ACLS will include space for two think tanks, multiple centers with cross disciplinary focus including the Lincoln Center, and the new ASU Alumni Law Group that will house the first teaching law firm associated with a law school. The FOUND:RE is set to open in early fall. The 105-room brand-new lifestyle hotel will be a one-of-a-kind experience with details, designs, public spaces and amenities inspired by contemporary art, culture, fashion and music. The hotel will enhance the city’s arts offerings with an impressive collection of contemporary art and creative guest programming woven into the entire guest experience for visitors and locals to enjoy. The modern hotel will contain a dynamic art component let by Cultural Curator Michael Oleskow who will be sourcing contemporary art of various mediums by local artists at that will inspire creative guest experiences. The FOUND:RE will be partnering with prolific design partners to create and industrial, raw design and aesthetic throughout, with furnishing and touches such as concrete floors, exposed ceiling and floating beds. The hotel will also have an on-site restaurant, MATCH Cuisine & Cocktails that will offer a creative menu of sharable plates focusing on eclectic, globally-inspired street food. Slap a jalapeno, sip a strawberrita and learn all about the art of mixology at Rico’s American Grill. Located at Pointe Hilton Squaw Peak Resort, Rico’s American Grill débuts its seasonal mixology program offering monthly mixology classes open to resort guests and locals featuring select spirits, cocktail demonstrations, house infusions, garden-to-glass recipes and much more. From history and spirit origin, to aromas and pairings, the classes are educational, interactive and fun for all. This month’s class is on Sept. 29, and focuses on bourbon. Pointe Hilton Tapatio Cliffs Resort is undergoing an $8.5 million guest suite renovation this summer. The tradition of delivering exceptional service and one of Phoenix&apos;s most unique resort experiences will continue as 544 of the resort&apos;s 584 all-suite guest suites will be remastered. The renovation completion is slated for October 2016. The redesign promises an elegant retreat experience inspired by the resort’s stunning views while tying in architectural elements with a fresh view of texture, color, scale and a subtle Spanish influence. What&apos;s better than a good Scotch? Good conversation to go with your Scotch. The Scotch Library at the Westin Kierland will present a special series of tastings featuring Tony Femino, host of Voice to America, an award-winning talk show that airs on KTAR radio. Tony has developed a special, interactive live event where the audience participates and listens to ideas about the most critical issues facing America today from people from around the globe. The first of the series will be on Sept. 20. The ‘paw-pular’ Hotel Radisson Phoenix North knows when you are taking a family trip; you want your four-legged friends to join in the fun! The hotel now allows your furry friends to stay and play at the Radisson for $50. Upon arrival your pet will be welcomed with the following: welcome note from our team, treat bag with some essentials, and a water mat and bowl to use during their stay. New music hits center stage; Center Stage Bar, that is! The Hyatt Regency Scottsdale Resort is welcoming a variety of musical entertainment from Progressive Folk Rock to Scottsdale&apos;s Favorite Party Band. Enjoy a new musical performance every night. Be sure to check out the Chad Gregory Trio. Chad Gregory’s music combines acoustic elements with emotionally charged honest sounds of country, throwing in that beer drinking attitude of the heartland. Born in Tulsa Oklahoma, his influences include a variety of music, though country, blues, folk, and gospel are the cornerstone of his southern roots sound. The styling’s of Chad Gregory fuse the raw roots of the Ozark Mountain sounds, with his pure brand of whiskey rock. The Monthly Mashup series returns this fall to Talavera at Four Seasons Resort Scottsdale at Troon North, kicking off Sunday, Sept. 11. Each month, one prominent local chef joins forces with Executive Chef Mel Mecinas for an unpredictable evening of culinary fun. September will feature Chef Bernie Kantak of The Gladly and October will have Chef Cory Oppold of Atlas Bistro. Each evening features a four-course tasting menu, with highlights from each chef’s culinary concept. The chefs join forces for a specialty amuse course to start the culinary journey. The cost for each event in the series is $95 per person, not inclusive of tax and gratuity. Saguaro Scottsdale, a 194-room hotel, is unveiling more than 12,000-square-feet of fresh indoor and outdoor event space and extensively renovated rooms this October. The relaunch includes the introduction of the Agave Ballroom and Patio, an ultra-flexible 5,285-square-foot event complex with a wraparound patio with fireplaces, fire pits and multiple outdoor dining and entertaining spaces at the foot of Civic Center Park. The newly renovated space will be the largest hotel event space in Old Town Scottsdale. New look, same luxurious resort. Hyatt Regency Scottsdale Resort & Spa at Gainey Ranch launched a room renovating this summer and is scheduled for completion this fall. The resort had just completed renovation on the upper lobby, meeting room corridors, Arizona Ballroom, Desert Garden and foyer. The resort also added beachside putting green, 28”rock climbing wall and a Himalayan Salt Room in the Spa Avania. On October 15, The Heard Museum opens Kay Walkingstick, an exhibition featuring one of today’s most accomplished American Indian artists. Over the course of more than four decades, WalkingStick, a leading practitioner of contemporary landscape painting, has avidly explored her own hybrid cultural identity, engaging Native history along with feminism, Minimalism, and other key art historical movements. She has become particularly renowned for her majestic and sensual landscapes, which imbue natural scenery with the charge of personal and collective memory. The exhibition will be on display through Jan. 8, 2017. This exhibition is organized by the American Federation of Arts and the Smithsonian’s National Museum of the American Indian. For those with a passion for fashion the Phoenix Art Museum will be opening on Nov. 6 the exhibit Emphatics: Avant Garde Fashion 1963-2013 which shows avant garde fashion from designers such as Alexander McQueen, Thierry Mugler, and Jean Paul Gaultier; just to name a few. For more than 50 years, James and Karin Legato built and curated Emphatics, one of the nation’s premier design retailers located in Pittsburgh. Now their astounding collection of more than 400 iconic fashions and accessories comes to the museum. Emphatics will be on display through Jan. 16, 2017. Strange things are happening at the Pueblo Grande! Local indigenous artist collective Radio Healer for an immersive performance on the back patio of Pueblo Grande Museum that uses tools, regalia, video, and sound to perform artworks that make the everyday familiar seem strange. Supported by a grant from the Arizona Commission on the Arts and building on over 10 years of exploration, the collective has combined technology, cultural practices, critical thinking, and community outreach into a singular experience. Using indigenous tools, which they created, Radio Healer performs re-imagined indigenous ceremonies that include amplified experimental music and sounds with oversized projections of video. Following each performance, members of the audience will have the opportunity to ask questions, and speak directly with the artists. This after-hours event is free and open to the public, donations are welcome. The first performance will take place on Friday, Oct. 28 at 7 p.m. The largest aquarium in the southwest opens this fall. The OdySea Aquarium will be a premier destination for locals and visitors. The OdySea Aquarium sets a new standard for how future aquariums are designed with its innovative use of theme park technology, creating an educational and entertaining oceanic adventure like none other in the industry. Spanning 200,000 square feet, the two-level facility holds more than 2 million gallons of water and accommodates up to 15,000 visitors daily. Named best of the West! Western Spirit: Scottsdale’s Museum of the West named Best Western Art Museum in the Nation. Since opening in January 2015, Western Spirit: Scottsdale’s Museum of the West has garnered numerous awards, achievements and accolades, including the designation of Smithsonian Affiliate. To these, it can now add “Best Western Art Museum in the Nation” for its “extraordinary exhibitions and dedication to Western art and culture.” The honor, bestowed by True West magazine, appears in a ranking of Western art museums published in the September 2016 issue. 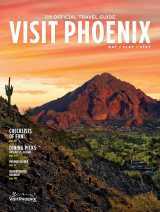 The 63-year-old, national publication is based in Cave Creek, Arizona and presents true stories of Old West adventure, history, culture and preservation. Don’t wait too long; this summer offer is almost gone! The VH spa at the Hotel Valley Ho is offering the perfect Pool Party Pedicure! Make a splash with pool-perfect feet and toes, featuring a lively palette of colors from Morgan Taylor. Once you choose your desired hue, lie back and relax as an orange peel scrub removes dry skin and argon oil and shea butter impart lasting moisture. You’ll also get a 20% discount on your choice of Havaianas sandals. Take $20 off the original price until the end of September. Back by popular demand, Sanctuary on Camelback Mountain will host a Soul Radiance Satori Retreat, Oct. 10-13. Led by master meditation instructor Sarah McLean, who has directed programs for Deepak Chopra, among other notable figures, the exclusive retreat will rejuvenate and guide guests to a peaceful and more fulfilling life. Participants will immerse themselves in three days of instruction and guidance in meditation, self-awareness practices and mindfulness, paired with four 60-minute spa treatments and healthy and nourishing meals daily. The retreat is limited to 12 participants and costs $2,261 per person. Who said naps are just for kids? At the Fairmont Scottsdale Princess’ Well & Being Spa, guests can “Sleep Well” with new innovative sleep-focused services using the A.R.T. of napping: the Acoustic Resonance Therapy in the So Sound Sleep Lounge, a zero gravity chair that induces total relaxation. Wearing headphones combined with vibration of the chair, guests can feel the music resonate through their body, creating a deep state of relaxation. Options start with a 30-minute Therapeutic Nap ($49) or the experience can be extended to one hour with the addition of Harmonized Acupuncture or Melodic Reflexology ($169). After spending more than 25 years serving the East Valley, Mancuso’s Restaurant has finally returned to where it got its start – Phoenix. The Park Street Food Bar is opening at the Collier’s Center in October. Dunkin&apos; Donuts is taking over the former Cigna space in Downtown Phoenix. There’s a new brew in town! A brand new brewery calls Arizona home. The Shop Beer Co. (formerly known as Cartel brewery) is located at 922 West First Street. The brewery will offer Coffee Brown Nitro and 480 Session Ale, as well as two new brews Sunset Daydream IPA and The Nines Hoppy Red. Central Phoenix&apos;s favorite Asian restaurant and craft cocktail bar, the Clever Koi is excited to announce the opening of a second location coming to Gilbert this fall. Scheduled to open this September inside a custom-designed space in the heart of Gilbert&apos;s historic downtown dining district, this all-new Clever Koi will feature the same menu of modern twists on classic Asian dishes that made the original location a critical and popular favorite, as well as its award-winning cocktail program highlighted by modern mixology and classic tiki drinks to the East Valley. Best of all, the new Clever Koi in Gilbert will serve up lunch and dinner daily (the Phoenix location closes on Sundays), as well as daily happy hour and brunch served from 11 a.m. to 3 p.m. on Saturdays and Sundays. Tucked inside the brick-accented Heritage Marketplace building, Clever Koi in Gilbert will feature a striking modern Asian décor, fully visible thanks to the large glass front façade. Z’Tejas Southwestern Grill Turns Up the Heat with 12th Annual Chile Feast! The menu recently launched and is available through October 15, Z’Tejas will offer their innovative Chile Feast menu at all five Valley locations. Sink your teeth into the Green Chile Queso or the Prime Pork Chop Milanesa stuffed with roasted pepitas, hatch green chiles, goat cheese and crispy jalapeño bacon! ZuZu inside the hip Hotel Valley Ho is serving up three delicious cocktails offered exclusively this fall. Try these autumn offerings in addition to ZuZu’s menu of signature cocktails and martinis. Light My Fire is a spicy concoction made with Redemption Rye, Aperol, lemon juice, chiles and black pepper. The fruity Apple Ginger Martini features sour apple and ginger liqueurs, Crown Royal Whisky and fresh lime juice. Or, try the Red Label Sidecar, made with Johnnie Walker Red Label Whisky, orange liqueur, and fresh lime and lemon juice. Stop by the lounge or restaurant to enjoy the cocktails for $12 each, September through December. To accompany new cocktails, ZuZu has unveiled a brand-new burger menu. The restaurant serves seasonal American fare made with fresh, local ingredients. Burgers are ground fresh daily, served on homemade buns. Try the Famous ZuZu Burger, which is made with smoked bacon, balsamic onion and blue cheese. For a more adventurous burger, try the PB+J Burger made with peanut butter spread, balsamic glazed onions and merlot wine jelly. Stop in for lunch or weekend brunch to try these new favorites. Kai, Arizona’s only Forbes Five-Star and AAA Five-Diamond restaurant is proud to present a match made in heaven: Cocktails and Dessert. Pastry Chef Audrey Enriquez and mixologist Liberty Quihuis have imagined an indulgent, five-course dessert and cocktail experience that celebrates their refined and innovative palates. This three-part series entitled, “Ladies of Kai” will take place on Thursday, October 13 and Thursday, December 1. The collaborative duo of Enriquez and Quihuis will offer entirely different menus at the three events, each evening a unique occasion. Each evening in the series will begin by inviting guests to a private reception with sweet hors d’oeuvres at 7:30 p.m. followed by seating at 8:00 p.m. The events are offered to a limited number of guests and will be priced at $65 per person. New chef, same delicious food! Market Street Kitchen is proud to announce the hiring of Executive Chef Michael Hunn to oversee this award-winning, market-driven restaurant and lounge. At MSK, Chef Hunn continues to serve up modern twists on classic rustic American fare, ranging from fresh pastas, hearty soups, creative salads and the freshest seafood available, plus farm-fresh wood-grilled vegetables and savory wood-fired chicken, pork, lamb and more slow-cooked on the custom rotisserie oven. Classically trained in French and Italian cuisine, and utilizing Japanese-influenced discipline in the kitchen, Chef Hunn&apos;s focus at MSK is a market driven menu and rotisserie cooking. Treat your Grandparents to a hearty meal just like they used to make, with National Grandparents Day (Sunday, September 11, 2016) at TEXAZ Grill, where all day long (10 am to 10pm) they will be serving up classic, rib-sticking Chicken & Dumplings for only $8. Brimming with from-scratch dumplings and hearty chunks of chicken, this creamy, filling stew is the same recipe that TEXAZ&apos;s Owner/Head Chef, Steve Freidkin learned from his mother back in Texas. Plus, all grandparents will receive complimentary Rice Pudding with an entrée order. Then exactly one week later, treat yourself to a TEXAZ Grill&apos;s famed cheeseburger for only $6 in honor of National Cheeseburger Day. Offered during Sunday Brunch on September 18 (10 am to 4 pm), savor a six-ounce, hand-formed beef patty cooked to order on a sesame seed burger bun with your choice of cheese, plus tomato, onion, pickle and lettuce on the side, served with TEXAZ fries. The Arizona Cardinals start their first regular game of the season Sept. 11, against the Patriots. The game will be at 5:30 p.m. at the University of Phoenix Stadium.